This morning I spoke with Iris Gonzalez, LZ Alexander, and Bahni Turpin of Cornerstone Theater Company. They are touring the state bringing this adaptation of the Shakespeare classic to 10 different communities. 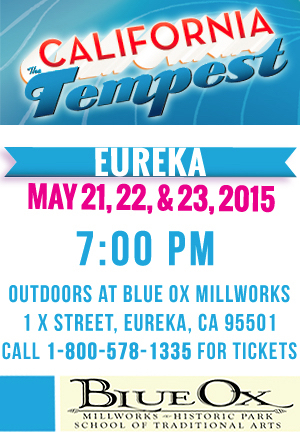 Next week, May 21 - 23, Thursday through Saturday they will be performing this at Blue Ox Millworks in Eureka. The play will have members of the theater company along with local members of our community. Two months ago they came on the air with me recruiting local talent. The play changes a bit in each community in which they perform You can reserve seats by calling 1-800-578-1335. Tickets are whatever you can afford. Playgoers are asked to arrive early and bring a nonperishable food item for Food For People. The play begins at 7pm each night.